"I love these products; my skin responds to the ingredients and I see results. A little goes a long way." Pamela C.
Institut’ DERMed Chromabright Serum, chosen as a "Hot Product Pick" from the editor's of American Spa Magazine, is formulated with Chromanyl Palmitate and Glycolic Acid to reduce the look of age spots and uneven skin tone for a radiant, luminous complexion. Smooth onto face and neck with finger tips until absorbed. For best results, use every evening. The serum may also be used on the chest, back of hands and body. Follow with the Institut’ DERMed Brightening Moisturizer. You may experience mild tingling or redness, but this is normal and should only be temporary until your skin adjusts. Clinically proven ingredients for healthy radiant skin. Chromanyl Palmitate - a new patented active molecule for skin brightening without the cytotoxicity of hydroquinone. 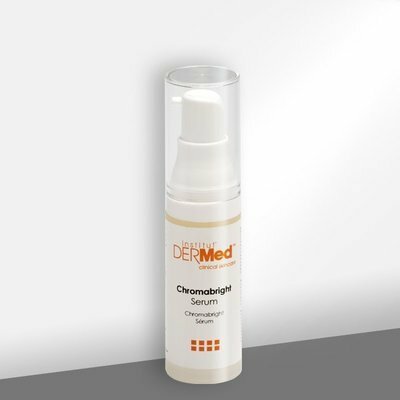 Chromabright is proven to have higher melanogenesis inhibition than Arbutin, MAP, and Kojic Acid. Glycolic Acid - an Alpha Hydroxy Acid derived from cane or beet sugar is a potent anti-oxidant and reducing the appearance of fine lines, wrinkles and assists in brightening. Aqua (Water), Caprylic/Capric Triglyceride, Glycolic Acid, Glycerin, Cyclopentasiloxane, Butylene Glycol, Cyclohexasiloxane, Arachidyl Alcohol, Aluminum Starch Octenylsuccinate, Sodium Hydroxide, Dimethicone, Hydroxyethenol Acrylate/Sodium Acryloyldimethyl Taurate Copolymer, Behenyl Alcohol, Squalane, Hexylresorcinol, Citrus Padadisi (Grapefruit) Peel Oil, Xanthan Gum, Arachidyl Glucoside, Sodium Benzoate, Polysorbate 60, Dimethylmethoxy Chromanyl Palmitate, BHT, Disodium EDTA, Sodium Hyaluronate, Glycyrrhiza Glabra (Licorice) Root Extract.